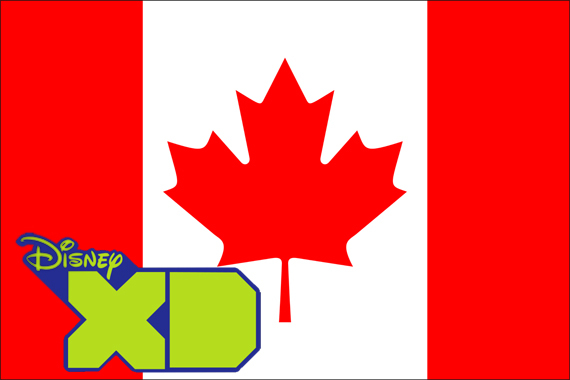 It appears Canada will join a whole host of other countries in their EXTREME DISNEY ACTION when we’ll get our own Disney XD channel in June. The channel, set up by Disney Junior, and Family Channel parent Astral Media will presumably take the US versions Disney produced programming and air it within a reasonable time span. Disney XD in the US is home to a variety of content, from Disney Channel reruns of Phineas and Ferb, to new Marvel series, and Naruto Shipudden. The smart money is on Astral using their CRTC approved Family EXTREME broadcast license for this channel, which expires in four years. It should be noted that the Family Extreme broadcast license is for a Category 2 channel, which would put it in the same tier to the likes of Nickelodeon Canada, than say, Teletoon. It will be interesting to see how Astral handles the channel. History shows that they’ve handled action series incredibly poorly on the Family Channel, often times sending them off to unpublicized early morning broadcasts, which in other terms means, they sent them to die. But, the ever increasing amount of Marvel animation on the US channel (a product of Disney’s takeover of the comic company) makes dumping these series to AM hours highly difficult as time slots are limited, and the popularity of the series should knock some sense into them. But at this moment, what I’m most curious about is how this leaves Teletoon. Teletoon has an exclusive relationship with Marvel preceding the whole Disney takeover, but I would have to imagine that deal may be close to expiring. If not, I would imagine that Astral, as a co-owner of Teletoon, may want to prioritize the Marvel content, and keep newer content exclusive to XD to encourage subscription. But as I mention before, as ownership is the same there is nothing stopping content from eventually finding its way to channels like Teletoon, or Family. Lastly, I understand some people may be waiting with bated breath on the possibility of Naruto Shipudden airing on the channel, but I’m sorry to be the bearer of bad news. Historically, Astral’s childrens’ channels simply live off of original productions, and stuff they get for low costs via their relationship with content producers such as Disney. Naruto’s a third party show on Disney XD in the US, and is handled by Viz Media, a company that Astal has never dealt with outside of the possibility of French dubs of their anime airing on Vrak.TV (which as far as I know, never occurred). Thanks to Jesse Betteridge for pointing this out to me. Interesting development. I’ll be keeping an eye on this, thanks for posting. will family extreme replace disney XD in four years? No, Family Extreme is likely the ground for which Disney XD will be launched on. Will Family channel still be playing DisneyXD original series and if it does which channel will play the new episodes. They’ll still air some shows I imagine, but a lot of it will got to Disney XD. WHY IS THERE NO ANIME IN CANADA!!!!!!!!!!!!!!!!!!!!!!!!!!!!!!!!!!!!!!!!!!!!!!!!!!!!!!!!!!!!!!!!!!!!!!!!!!!!!!!!!!!!!!!!!! I wonder who is going to be the voice of disney xd is it going to be the same voice from america???? Will they still be airing family channel? cause my kids will be some diappointed. if they can watch wizards of wavery place, hannah montana, sonny with a chance, and them if they cancelled the family channel, will they still play them shows??? i just hope that there will still be a family channel !! please help. Sorry for taking a few days to reply to you, but yes Family Channel will still operate. They’ll likely air those shows for as long as they see fit. Haha, but there really wouldn’t be much of a difference. Family Channel is Disney Channel Canada. No it won`t air on Disney XD Canada.